An all Mozart concert, featuring a symphony and a piano concerto. Our annual, signature performance of Handel’s Messiah. Lutenists Paul O'Dette and Ronn McFarlane. 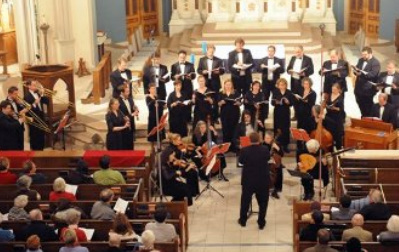 A program of Bach cantatas, with Illuminati Vocal Arts Ensemble. Ian Watson, Arcadia Players’ Artistic Director, played an important role in the British Baroque revival which brought such renowned orchestras into prominence as the Academy of St. Martin in the Fields, the English Chamber Orchestra, the English Baroque Soloists, the Monteverdi Choir and The Sixteen, with all of whom he has performed as organist, harpsichordist, solo pianist and/or director. Ian’s versatility is revealed in the equal ease with which he performs the roles of orchestral conductor, choir director, organist, harpsichordist, pianist, teacher and public speaker. and more. local agencies supported by the Massachusetts Cultural Council, a state agency. Acadia Players is Ensemble-in-Residence at the Massachusetts Center for Interdisciplinary Renaissance Studies.